Famed New York City grocer Dean & DeLuca just unveiled its latest concept, STAGE, a fast casual eatery with gourmet offerings, at 29 Ninth Avenue. 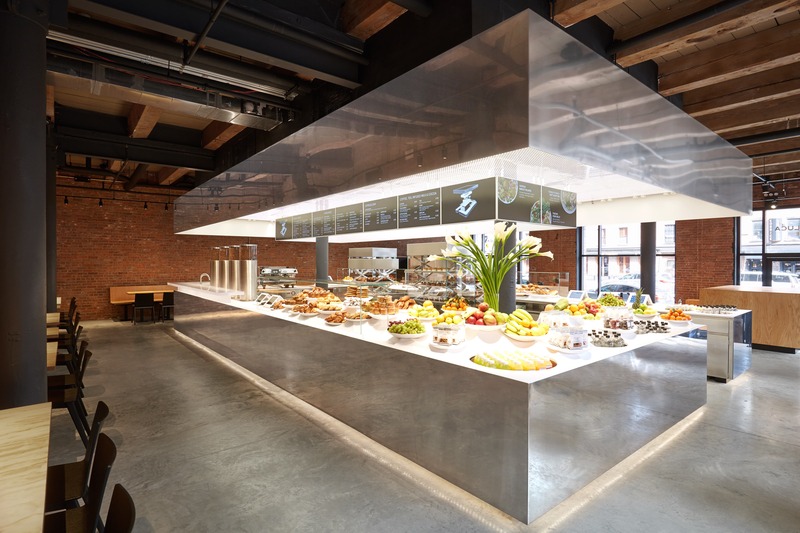 Dean & DeLuca STAGE by Ole Scheeren © Buro-OS (Photo by Julian Faulhaber). The sleek eatery, designed by architect Ole Scheeren, serves a variety of high quality meats from beef to slow roasted turkey and roasted porchetta, as well as salmon and special vegan options. An all-day beverage station has a selection of coffee and juices, with wine and beer offerings later in the day. Out of plain sight is a small takeaway window near the left back corner where customers can have food boxed in small black packages when on the go. STAGE serves breakfast, lunch and dinner from 7 a.m. to 10 p.m. every day. A second STAGE is set to open in Midtown later this summer.